In 2011 the Martinborough region experienced warm temperatures at flowering and a very even fruit set with good crop levels which, due to good summer temperatures, led to an early veraison. The fruit reached optimum ripeness with great flavor concentration and arrived at the winery in excellent condition. The good physiological and flavor development at lower sugar (brix) levels allowed the wine to show good flavor and Pinot texture. The fruit was 100% destemmed and fermented for 8 days in small fermenters by clone with hand plunging at six-hourly intervals, post ferment maceration and gentle pressing off. Careful barrel selection using French oak Damy and Cadus barrels to balance the tannins and 16 months maturation in 20% new oak resulted in a well balanced wine. Nose: Ripe intense classic aromas of soft plum and black cherry with developing gamy and earthy complexity. Palate: Rich fruit dominates the palate supported by soft tannins that have developed a silkiness with bottle age. A concentrated, full-bodied Pinot Noir yet elegant and balanced, with mineral, fruit and oak flavors, showing classic Pinot Noir complexity and supple texture. 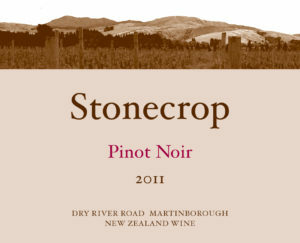 “A terrific Pinot Noir value, Stonecrop’s 2008 exhibits smoky, cedary aromas, but balances the oak with a solid foundation of cherry fruit and savory, mushroomy complexity. It’s full bodied yet elegant, with a meaty finish”. 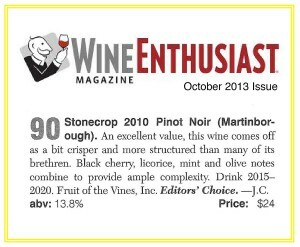 Wine Enthusiast Magazine 2010, rated 91pts and Editor’s Choice.